Jakraphan Chaijit paints young elephants with a palette of acrylics. "I was inspired to create this work of art when I worked, painted and lived with elephants. It was during that time that I learned about their feelings. Elephants can paint artworks. They demonstrate a masterful use of the brush with their trunk, producing fresh, spontaneous, free, determined, powerful, lively yet sometimes soft works of art. I painted two of my young elephant friends and applied on top brush stokes similar to what they would have painted," explains Jakraphan. The artist signs the painting in Thai. This painting was made by Jakraphan Chaijit. 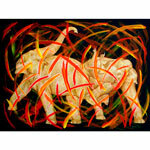 He is very fond of elephants and creates artistic works inspired by them. He is married and has one son. 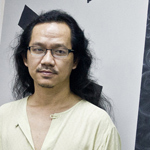 He paints in his hometown in Chiang Mai and has exhibited his artworks 24 times in Thailand. ... Read Jakraphan's full biography on Ezistock Blog.